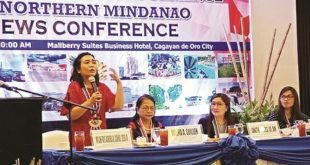 The group reported that the flyers were discovered by delegates attending the assembly and launching of Hustisya-Northern Mindanao two Fridays ago at Philtown Hotel. A suspected military agent approached the guard of the hotel and handed him two brown envelopes with each contained 13 copies of the flyers, it added. Included among the list are Iglesia Filipino Independiente Bishop Felixberto Calang, Fr. Rolando Abejo of Movement Against Tyranny-Northern Mindanao, Karapatan Northern Mindanao spokesperson Fr. Khen Apus, human rights lawyers Beverly Musni, Czarina Musni, and Beverly Ann Musni, and journalist Leonardo Vicente “Cong” Corrales and two of his family members. “Such notorious lists have further endangered the already perilous situation of human rights defenders. We have repeatedly raised how these arbitrary and baseless accusations incite threats to the lives and security of named individuals, the worst of which is that they become victims of extrajudicial killings,” said Karapatan secretary general Cristina Palabay in a statement. Also written on the flyer is a warning that members of the CPP visit jails in the cities of Cagayan de Oro and Malaybalay in a National Solidarity Mission. It mentioned that Karapatan conducts meeting inside the United Church of Christ in the Philippines located at Licoan, Cagayan de Oro. The mission held on Feb. 21 and Feb. 22, Palabay said, aimed to assist the families of victims of human rights violations in the region and to “look into the situation” of arrested progressive leaders Datu Jomorito Guaynon of IP group Kalumbay, KMP leader Ireneo Udarbe, and four members of the Misamis Oriental Farmers Association and that of evacuees from Lagonglong, Misamis Oriental. Karapatan, IP and Moro group Sandugo, and peasant group Kilusang Magbubukid ng Pilipinas led the said mission and engaged with the Commission on Human Rights-Region 10 (CHR-10) to call for their release. “Activists and everyone is being wrongly tagged as terrorists. The anti-terror law is being arbitrarily used against activists like Guaynon and Udarbe. 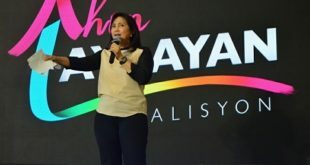 This situation is made worse by the continuing implementation of martial law in Mindanao,” Palabay said.